We went out this morning and I managed to get the youngest and the wife up on slalom skis. My youngest son is 12 and small for his age. I had him try the radar TRA at 63" and he managed to get up about 4 times but fell over after about 50' each time. I was excited for him and I think he wants to try it again. I strapped on the HO OMNI with my radar profile boot and a RTP. I really like the profile boot! It is the first time my foot hasn't gone to sleep or cramped. The OMNI is a nice ski and I would jump on it again but want to try the carbon version. I ran at 30 mph and it felt slower than the Senate I tried before it. I popped right up and didn't feel any strain or struggle like I do with my old HO. It was super stable and easy to carve around on. I am really excited to get my graphite senate next week. Now I just need a couple friends that like to get up early. My wife.......... not soooo much. Lots of coffee was involved. I didn’t even have that good of conditions this morning! Saw a beautiful '16 txi today! It was a lime green and black combo. That lake is 1.5 hour drive from our house. All freeway and in the middle of nowhere. Boat said the water was 73* but it felt closer to upper 70s. We don't go much because of distance and the family cabin. I knew we could get some good water there and the local lake is hit or miss. My wife insisted on the slalom tug, after we bought the vtx, now we are considering going back to 1 boat. She says the slalom tug stays, the other one can go. Oh and congrats on getting everyone up and skiing! We always offer to take anyone, especially new people for a pull. Love the feeling of getting a new person up on skis. You are my hero. At least a couple of the kids will occasionally want to ski. But mostly, the older (girls) and 67Queen just want to surf. 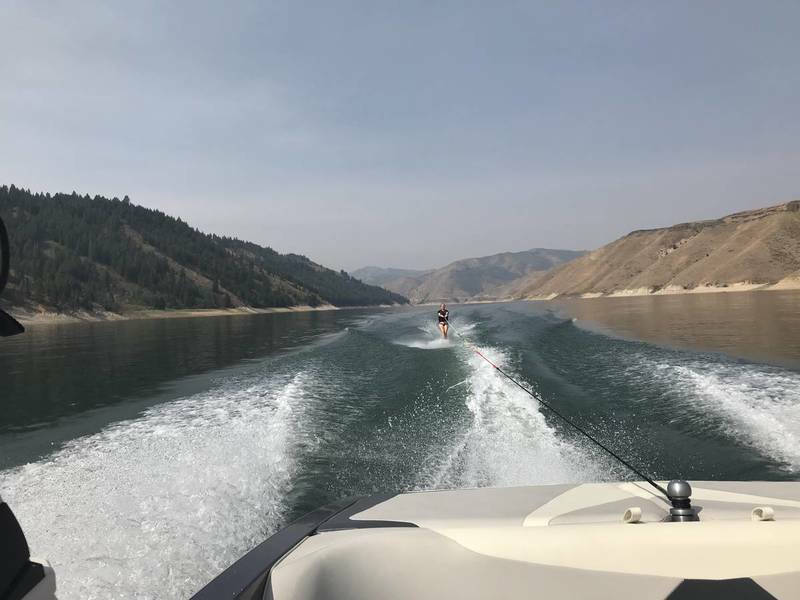 67Prince got up on a wakeboard for the first time last week. I'm the only single sticker out there. Congrats on getting your son up on the wakeboard. I love surfing but the last couple of years I’ve been craving the ski. My 14yo wants to do whatever I’m into and my 12yo will follow when his older brother tries. I’ve been working on my wife for a couple years now. She was scared of the speed (scorpion on a wakeboard will do that) and kept passing on trying. I surprised her with the butterknife on Friday and explained we could go slow vs me doing 28 - 30. Warm water and no one around = best time to try. It’s a good feeling when the whole family gets involved. Good for you all! My family has no interest in slalom. About once per year, my wife will go one lap on two skis. The kids both have been asking to wakeboard more this summer. So maybe one day I'll get there. Congrats to your wife and son, and to you as well! Even though it was nearly 20 years ago, I recall the day both of my sons first got up on a ski like it was yesterday. They had already been wakeboarding for 5-6 years when I rented a wide-body Connelly ski for the day. They both got up and skied on the second or third attempt but it wasn't until the next outing, when they skied a skinnier stick at faster speeds, that they really had fun. It doesn't happen nearly often enough anymore, but my wife and I relish the times we get the ol' 4 skier family rotation going. Sorry, she is one of a kind. And to think, when we met she didnt know how to waterski.....😀 i know i did something right. My kids are 13 and 15 this past summer. I was into watersports before they were born and had an i/o we all went out on. They learned to kneeboard, ski and wakeboard on that boat by ages 7 or so. With the ssvlx they do all that plus slalom and now surf. All recreational free ski stuff. I need to invest in newer skis and better wakeboard bindings. Wife can ski but has wrist issues for several years but loves to drive the boat.